Albert Allen Graffham was born in Ottawa, Kansas on Nov. 21, 1918 to Albert and Ida Linden Graffham. He attended the University of Kansas for three years as an undergraduate in geology, and then worked as a groundwater geologist for the U.S. Geological Survey. Allen was drafted and served in the Seabees (the Construction Battalions of the United States Navy) during W.W. II and took part in the Invasion of Okinawa. After his stint in the service, Allen attended the University of Nebraska, teaching mineralogy and working as a collector-preparator for the Geology Museum while finishing his studies. He obtained his Bachelors and Masters Degrees in Geology from the University of Nebraska in 1950. Following graduation, he attended Stanford and took special courses in paleontology to help prepare him for work as a geologist for an oil company in Oklahoma. As a geologist-paleontologist, he also did exploration for oil in Ecuador in the early 1950's. Allen also was co-owner and founder of Earth Science Magazine, doing much of the writing for this publication during its first year. Allen became the first curator for the Tucker Tower Museum at Lake Murray State Park, near Ardmore, OK. In 1952, he recognized a local peculiar rock as a meteorite. This, the Lake Murray Meteorite, is a rare fossil meteorite that fell to Earth 110 million years ago. In 1955, Allen purchased a building on the south side of Ardmore, OK, and founded Geological Enterprises. Through this business, Allen collected, prepared, identified, studied, displayed and sold fossil & mineral specimens to the public as well as to most of the natural history institutions throughout the world. He donated thousands of fossils to scientists, researchers, universities, and museums. Allen started the modern retail, mail order fossil business. Long before internet and e-mail, long before EBay and Sotheby's, Allen was there, marketing fossils to the public and institutions that were in need of fossils for display and study. In 1989, Allen and Fran purchased the largest and most complete skeleton of an Early Cretaceous meat-eating dinosaur, Acrocanthosaurus atokensis, found in McCurtain County, Oklahoma. In the mid 1990's he funded the preparation, molding and mounting of that incredible dinosaur, and the specimen is now a premier exhibit at the North Carolina State Museum of Natural Sciences in Raleigh, NC. Allen was a founding member of the Association of Applied Paleontological Sciences (or AAPS), their first President, and served on the Board of Directors from the late 1970's through the 1980's. He was also a long time board member of the Goddard Youth Camp - a camp that teaches children about fossils! The main room of the museum is called "Graffham Hall" and displays many Geological Enterprises fossils including a cast of Acrocanthosaurus atokensis. In 1989, Allen married the love of his life, Fran Manton Graffham. They remained inseparable until Allen's illness forced him to move from his home into full-time care. With Allen in hospice, Fran still almost never left his side. Even at the end, Allen seemed to be happy only when she was with him. Allen loved his family, his friends, his business, fossils of all kinds, antiques from every age and he really loved life. He will be missed by all who knew him and remembered for his boundless energy, his incredible knowledge, his wonderful smile and his abundant and fascinating stories. 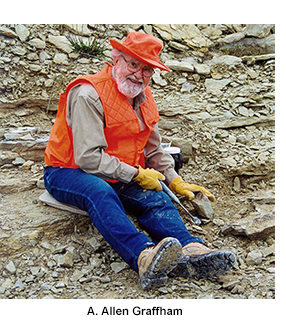 Allen was the second recipint of the "Charles H. Sternberg Medal for Contributions to Paleontology" in Tucson during the 2004 AAPS annual meeting, recognizing his life-long contributions and achievements in the field of paleontology. Nearly two hundred of his colleagues, family members, students and friends were there at the meeting for the presentation. A. Allen Graffham passed away at 6 am, July 13, 2009 at the Ardmore Veterans Center in Ardmore, Oklahoma following a long battle with Parkinson's disease. He is survived by his wife Fran; his children Jan Nelson, Joan Lester, Vala Stabler, Linda Richie, Terry Manton, Michael Manton; his wonderful grandchildren and great-grandchildren, a brother, Jack Graffham, a sister, Roberta Hazel, numerous friends and business associates throughout the world; and Leon Theisen & Donna Russell who thought of him and cared for him as their father. Allen Graffham was an inspiration, a motivator, a pioneer, a paleontologist, and one of the greatest fossil collectors the world has ever seen. He was also a geologist, an archeologist, an author, and a philanthropist. He was a mainstay in the fossil business, with over 50 years at the helm of Geological Enterprises. A memorial has been established with AAPS to fund the A. Allen Graffham Research Grant. This grant is awarded to selected researchers that publish on specimens collected by, or in collaboration with, other AAPS members.